Question: Why “Petrochronology”? Why add another term to an already cluttered scientific lexicon? Answer: Because petrologists and geochronologists need a term that describes the unique, distinctive way in which they apply geochronology to the study of igneous and metamorphic processes. Other terms just won’t do. Such evolution of language is natural and well-established. For instance, “Geochronology” was originally coined during the waning stages of the great Age-of-the-Earth debate as a means of distinguishing timescales relevant to Earth processes from timescales relevant to humans (Williams 1893). Eighty-eight years later, Berger and York (1981) coined the term “Thermochronology,” which has evolved as a branch of geochronology aimed at constraining thermal histories of rocks, where (typically) the thermally activated diffusive loss of a radiogenic daughter governs the ages we measure. Thermochronology may now be distinguished from “plain vanilla” geochronology, whose limited purpose, in the words of Reiners et al. (2005), is “…exclusively to determine a singular absolute stratigraphic or magmatic [or metamorphic] formation age, with little concern for durations or rates of processes” that give rise to these rocks. Neither of these terms describes what petrologists do with chronologic data. A single date is virtually useless in understanding the protracted history of magma crystallization or metamorphic pressure–temperature evolution. And we are not simply interested in thermal histories, but in chemical and baric evolution as well. Rather, we petrologists and geochronologists strive to understand rock-forming processes, and the rates at which they occur, by integrating numerous ages into the petrologic evolution of a rock. It is within this context that a new discipline, termed “Petrochronology”, has emerged. In some sense petrochronology may be considered the sister of thermochronology: petrochronology typically focuses on the processes leading up to the formation of igneous and metamorphic rocks - the minerals and textures we observe and the processes that formed them—whereas thermochronology emphasizes cooling processes in the wake of igneous, metamorphic, and tectonic events. Typically petrochronology is “hot”, thermochronology is “cold”. While each field has its unique features, and while their disciplinary boundaries overlap, each complements the other. Any rock sample we study, whether igneous, sedimentary, or metamorphic, results from the transformation of one or more previous rocks. Petrologists and geochemists have found that such transformation rarely erases a rock’s memory completely, instead most samples contain relics from more than one stage of their evolution. Whether and how these affect an age determination is essentially a question of resolution—both spatial and chronometric—i.e., of isotopic and chemical analysis. Analytical efforts in petrochronology typically find that several stages or generations of mineral formation are evident in any single rock sample, in which case we conclude that such a rock does not have, sensu stricto, one age. In fact, one is led to wonder what the term “age” may signify in everyday geologic usage. It might seem clear what is meant, for example, by the age of a basaltic lava flow: the time of deposition or solidification. But what is the age of a meta-basalt? Does it refer to the point on the prograde path when its mineralogy and texture would define it as “metamorphic”, and no longer igneous? The pressure peak? The maximum temperature? 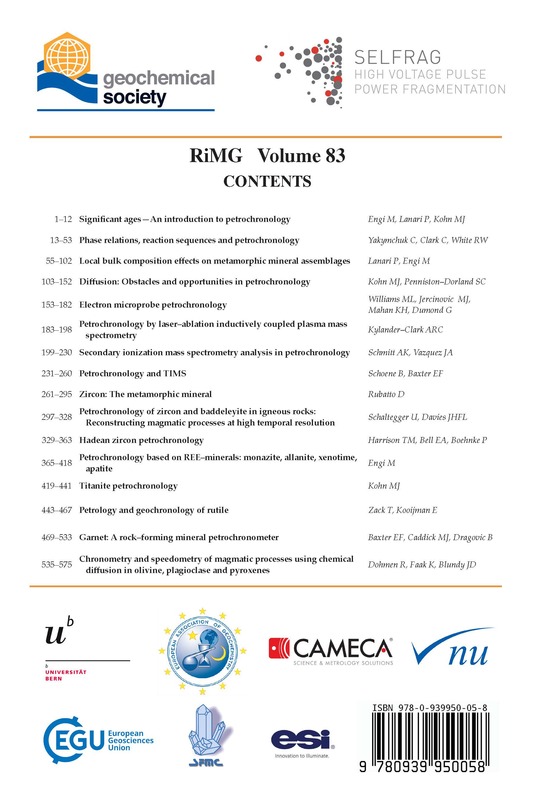 The point on the retrograde path where mineralogy and chemistry no longer change measurably? And by what methods can that singular metamorphic age be measured? Actually, defining “an” age of a volcanic rock presents its own problems. How do we choose among the ages of initial melting, magma movement or rejuvenation, crystallization of antecrysts and duration of residence in a magma chamber, eruption, or solidification? And what does an age mean for a clastic rock, where each grain may have a slightly different parent, and materials may be reworked. The concept of “an age” really makes sense only within a defined petrogenetic context. This recognition leads us to a practical definition: Petrochronology is the branch of Earth science that is based on the study of rock samples and that links time (i.e., ages or duration) with specific rock-forming processes and their physical conditions. 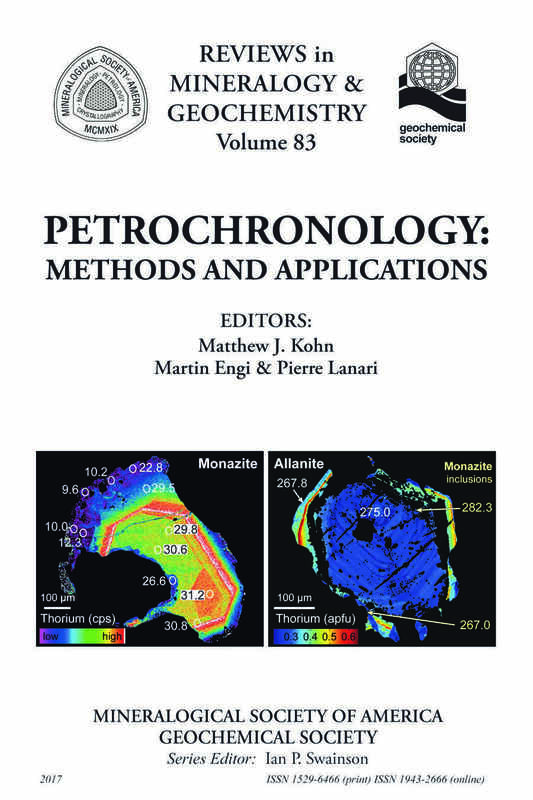 Petrochronology is founded in petrology and geochemistry, which define a petrogenetic context or delimit a specific process, to which chronometric data are then linked. Matthew J. Kohn, Department of Geosciences, Boise State University, Boise, Idaho, U.S.A.
by Martin Engi, Pierre Lanari, Matthew J. Kohn, p. 1-12.
by Chris Yakymchuk, Chris Clark, Richard W. White, p. 13-54.
by Pierre Lanari and Martin Engi, p. 55-102.
by Matthew J. Kohn and Sarah c. Penniston–Dorland, p. 103-152.
by Michael L. Williams, Michael J. Jercinovic, Kevin H. Mahan, and Gregory Dumond, p. 153-182.
by Andrew R. C. Kylander–Clark, p. 183-198.
by Axel K. Schmitt and Jorge A. Vazquez, p. 199-230.
by Blair Schoene and Ethan F. Baxter, p. 231-260.
by Daniela Rubatto, p. 261-296.
by Urs Schaltegger and Jishua H. F. L. Davies, p. 297-328.
by T. Mark Harrison, Elizabeth A. Bell, and Patrick Boehnke, p. 329-364.
by Martin Engi, p. 365-418.
by Matthew J. Kohn, p. 419-442.
by Thomas Zack and Ellen Kooijman, p. 443-468.
by E. F. Baxter, M. J. Caddick, p. 469-534.
by Ralf Dohmen, Kathrin Faak, and Jon D. Blundy, p. 535-575.